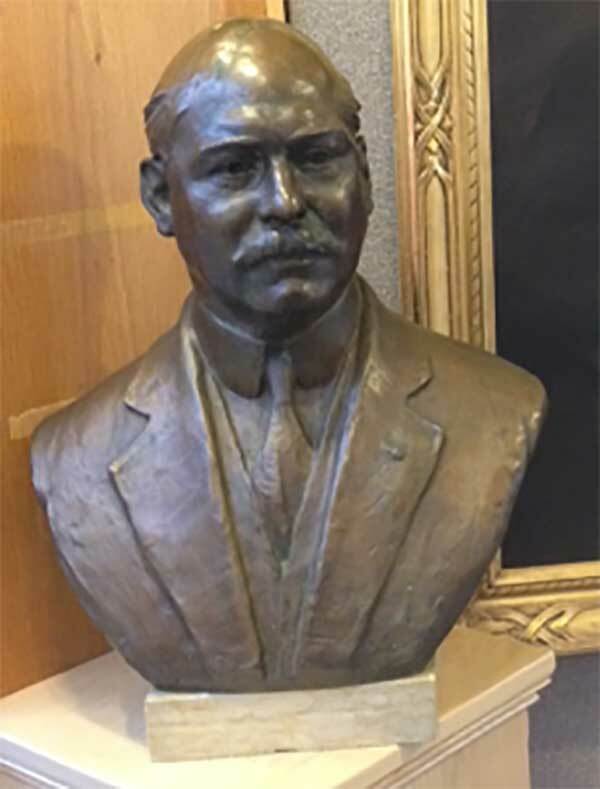 John Wingate Weeks (1860-1926), Bronze portrait bust by Frederick Warren Allen, Sculptor. Secretary of War, Mayor of Newton, Congressman and U.S.Senator. Co-founder of Hornblower and Weeks. Creator of the Weeks Act that saved our National Forests. His ashes were buried in grand style at Arlington National Cemetery and a road there was named in his honor. Also named after him were a U.S. Navy destroyer, a footbridge over the Charles River in Cambridge, Weeks State Park, Mount Weeks, and Hornblower & Weeks. He cared about New England and conservation of its land. It was a focus in his life. He died in his beloved mountains at his home in Lancaster. It was a grand building in the Neo-Gothic style with a central tower flanked by lower wings that wrapped around the circle of road that passes it. In the entry was a grand split stairway with a balcony overhanging a wall where a niche was built to accommodate the bust of JWW as a memorial. The black wrought iron on the stairs and balcony were dramatic against the white walls and a large black iron lamp hung in the two-story entry between the stairways. A photograph of the bust in that niche shows that Frederick Allen originally designed the portrait with a natural bronze head and neck above a clothed body colored a dignified black. Sculptors were aware of architectural styles and those who were allied with architects, as Allen was, would coordinate their work with the stylistic elements of the building they were decorating. The black coloration on the clothing of Week’s bust would have been dramatic punctuation to the wrought iron details of the entryway. Notice in the accompanying portrait photograph that Weeks was wearing a black jacket and tie. The bust now resides at the Society for the Protection of New Hampshire Forests, but the black color on the jacket, shirt and tie have been removed, perhaps by some well-meaning person who believed that the portrait had been defaced by the color. There are traces remaining on the bronze. The evidence is there also in the difference in metal color, the underlying bronze being lighter than the untouched metal of the head and neck, a chemical change that happens in the aging process. Polychromy in sculpture is an art form that was controversial at the time the bust was created. The argument was with the traditionalists who wanted to protect the purity of form from being sullied by “cheapening” it with color to make it more realistic. The purists sought to keep the lines between painting and sculpture clear. Crossing that line somehow blurred the intentions of each. Not many American sculptors dared to cross that line. Allen was one of them. Looking at the bust next to a painted portrait and to several photos, the likeness is captured perfectly. He was a broad-shouldered man with a stocky neck so the bust is tapered from the width of the shoulders to just below the sternum, accentuating his strength. Clothing communicates a message. He is dressed in a dignified three-piece suit of someone in a position of responsibility, a necktie with a long knot between the rounded points of the narrow-spread shirt collar he seemed to favor. Most of his photographs show him with a small round pin in his left lapel, which is reproduced in this portrait bust. Allen was interested first in the shape of the skull, and Weeks had a distinctive tall, egg-shaped head with the narrower end at the top of a high forehead. Anyone who knew him would recognize that head from a distance. Allen made it smooth and polished. In contrast, texture is used in the details of his face. There are frontal eminences above straight brows over large knowing eyes. His average nose and full lips are separated by a large bushy mustache and his chin is round and dimpled. It is a realistic portrayal so Allen hasn’t left out the sagging under-eye skin. He looks straight ahead with a peaceful yet confident and intelligent expression. Here was a man who cared with his heart about New England and knew how to get things done!